As outlined in an earlier research note (here), the original WheeStat was limited to voltages between +/- 1.65 volts on both the working and counter electrodes. 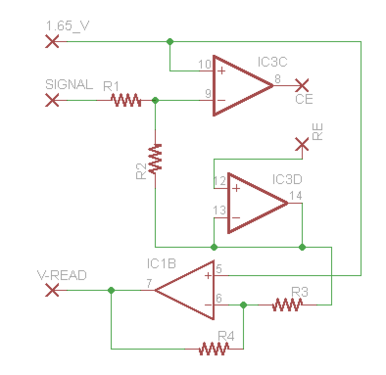 In this research note, I describe how we redesigned the potentiostat to give +/- 12 volts on the counter electrode and up to +/- 5 volts on the working electrode, all without a detectable frying (yet anyway) of the 0-3.3 volt compatible electronics. In the schematic above, R2 is three times R1 and R3 is three times R4. This causes the voltage difference between the working and reference electrodes to be three times the signal voltage and the voltage read at the VRead pin will be one third the true value of the voltage difference. That means that the effective voltage range that can be applied will be three times that of the original WheeStat; +/- 4.95 volts instead of +/- 1.65. A little bit of hocus-pocus in the computer code and the correct current and voltage values magically appear as the output to the GUI. In the schematic above, the current following circuit attached to the working electrode (labeled WE) is protected against voltage spikes. If the voltage at WE goes above +3 volts, current is passed upwards through the diode. 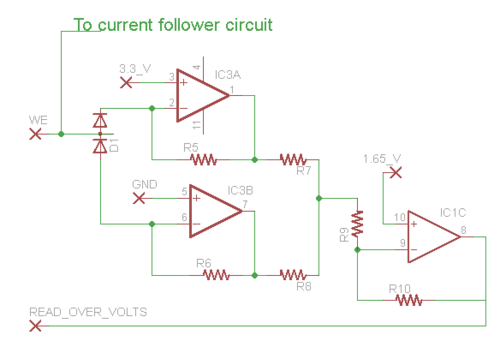 If the voltage goes below 0 volts, current passes downward through the diode. The voltages immediately above and below the diodes are maintained by the two op amps, which are also set up to be current followers. 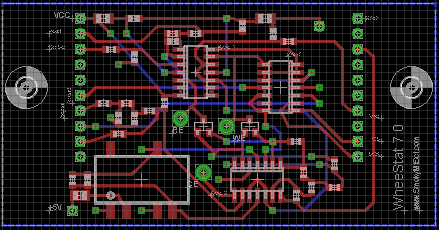 The output from IC3A is 3.3 - iR5 where i is the current passing through the upper diode. The output from IC3B is +iR6 where i is, in this case, the current passing through the lower diode. In this case, R5 and R6 are both 200 ohms and the remaining resistors are 1K. In the absence of a current passing through one or the other diode, the outputs from the two amps are 3.3 and 0 volts, and the voltage of the junction between R7 and R8 will be 1.65 volts. A negative deviation from this value would indicate that current is passing through the upper diode, while a positive deviation would indicate that current is passing through the lower diode. This deviation is amplified by op amp IC1C and is read at the READ_OVER_VOLTS pin of the microcontroller. If the microcontroller reads a value that deviates from the expected 1.65 volts, the code can determine whether the voltage at the working electrode is too high or too low and adjust the applied voltage accordingly (right now it is just set to throw an error message and shut down). Q4: Those chips look really small. Did you change the spec on the resistors and caps? A: Yeah, we went to 603 package this time. That makes the boards cheaper but it is kind of a pain in the but to place all the little buggers on where they are supposed to be and you can not even see the little markings on them. 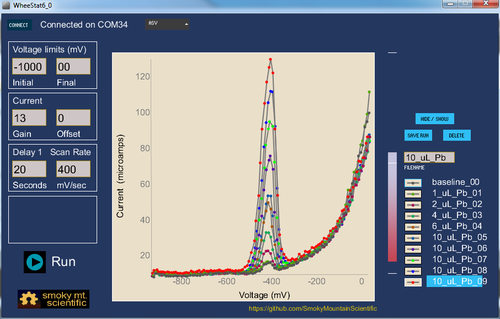 Q5: Have you tried running any voltammagrams using the new boards? A: Yes. 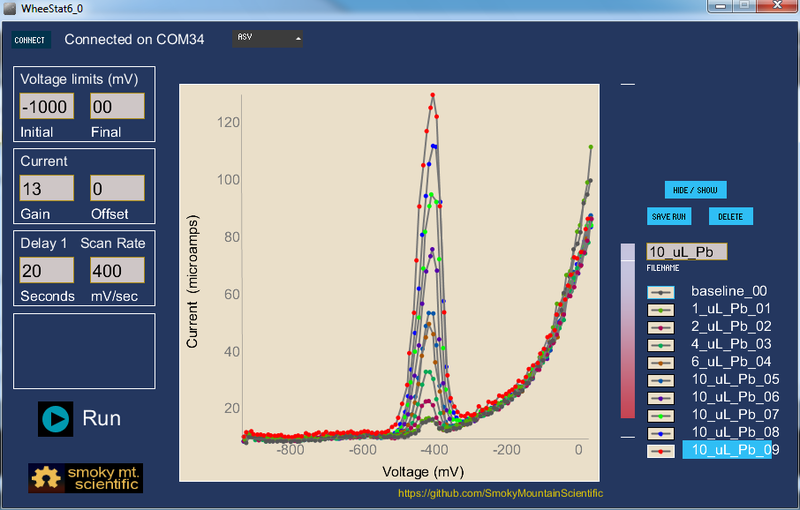 Below is a screenshot of some stripping voltammagrams of lead containing solutions. Q6: Whoa, dude! Is that an entirely new user interface? A: Yep. Very perceptive of you to notice. The new interface has an automatic com port connection feature and the improved file manipulation scheme described in an earlier research note. Q7: Sweet! A: That is not a question. Q8: Oh, sorry. How do I get one of the new boards? A: They are not available yet. I will let you know when they are. Q9: Can I make one myself? A: Of course, this is all open source stuff. Just let me know you want to and I will put the board file on the share list at OSH Park. Then you can order a board and build it up yourself. Q10: Where can I get the schematic? A: Um, I haven't put it online yet. When I do it will be on this site. Gotta do something with my summer.